Why isn’t ultimate 1980s vocal collective in the Rock & Roll Hall of Fame? In mid-October, when 19 nominees were announced for the 2017 class of the Rock & Roll Hall of Fame, it was as if a pop culture grenade had been unpinned. It’s all music, but the entire process is very political. Pearl Jam is on the list, along with Jane’s Addiction and Depeche Mode. Electronic music pioneers Kraftwerk. The Cars. Influential disco legends Chic, in their 15th year of eligibility, as well as soul legend Chaka Khan, in her 14th year of eligibility. Folk goddess Joan Baez is there, too. In a bit of real poetic justice, Tupac Shakur and Janet Jackson were announced. For Tupac, it’s his first year of eligibility, while the Control superstar has been overlooked since 2007. Chosen by committee and by social media vote, the newest inductees will be announced in April 2017, and the 32nd annual Rock & Roll Hall of Fame concert will again take place at Brooklyn’s Barclays Center. Will groundbreaking, black punk underdogs Bad Brains make it on their first try? Will Tupac join fellow rhyme heroes Grandmaster Flash and The Furious 5 (2007), Run-D.M.C. (2009), the Beastie Boys (2012), Public Enemy (2013), and N.W.A. (2016)? It seems like everyone has a favorite who has been passed over by the house that Rolling Stone founder Jann Wenner built — an institution that has been accused of being “too male, too white, and too rich.” And because of its history, its massive success, and its impact on black and mainstream culture, it’s starting to sting that New Edition continues to be ignored by the Rock Hall. The group has never even been nominated. 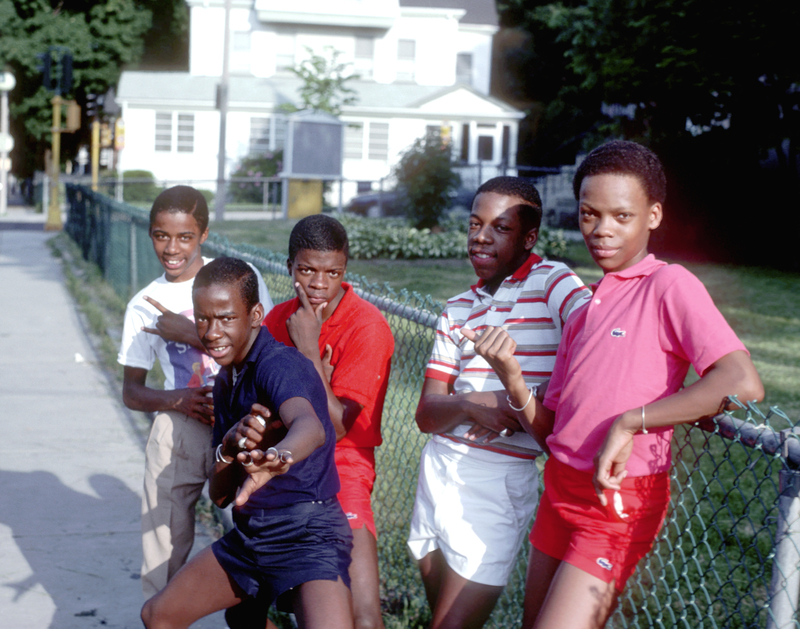 Ricky Bell, Michael Bivins, Bobby Brown, Ronnie DeVoe, Johnny Gill, and Ralph Tresvant, are New Edition, the most influential, genre-spanning, rhythm and blues vocal group of the ’80s, formed in 1978 in Boston. The group has been eligible for induction into the Rock & Roll Hall of Fame since 2009. Together, as solo acts, and as the pioneering new jack swing trio Bell Biv DeVoe, they’ve sold close to 30 million albums. 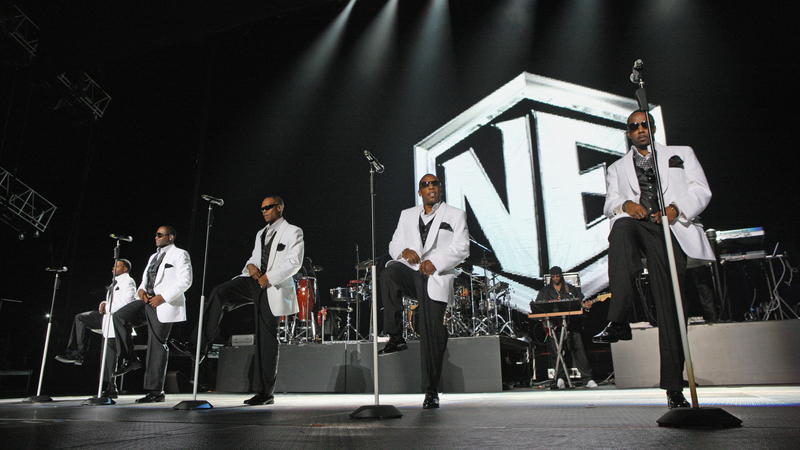 New Edition, beloved by millions, has toured amphitheaters and stadiums successfully for 32 years. January brings a BET miniseries based on the group’s tumultuous stories. There is a Hollywood Walk of Fame Star on the way. Hollywood continues to embrace New Edition’s music, style and choreography, which was celebrated to great acclaim in 2013’s The Best Man Holiday. 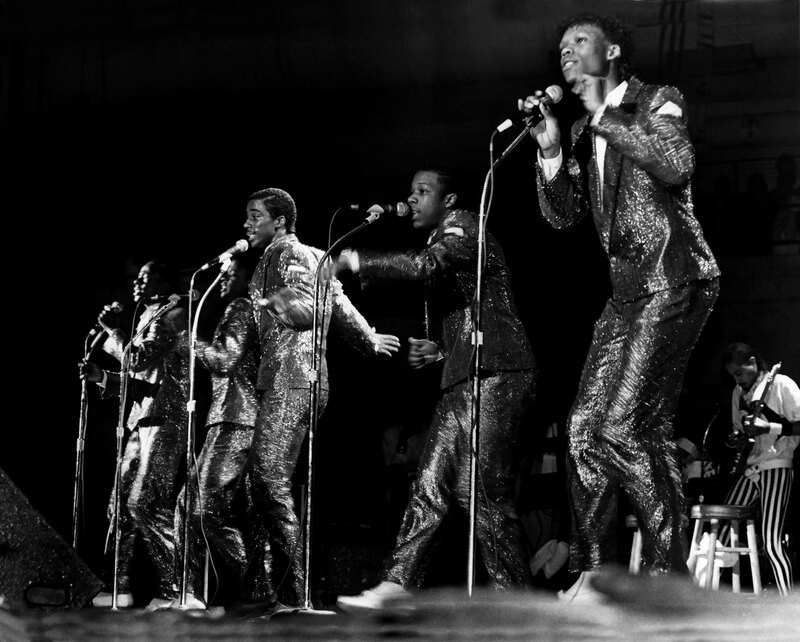 Photo of New Edition in the early 1970s. Their talents were honed in black talent shows before being “discovered” by African-American Boston music Svengali Maurice Starr, who got them signed to MCA. New Edition fell out with their controlling mentor over reported creative and business differences in 1984, but it was New Edition’s alluring concept that helped Starr launch multiplatinum white pop vocal group New Kids On The Block. An ambitious Bivins, the business-minded visionary of New Edition, learned from Starr. By the next decade, he would oversee and manage his own stable of multiplatinum groups, including best-selling Philadelphia singing phenoms Boyz II Men and the hip-hop/R&B kiddie act Another Bad Creation. It was further proof of New Edition’s malleable DNA. New Edition’s influence is diverse and deep and zigzags from classic R&B, and rap to pop. From the aforementioned New Kids and Boyz II Men, Guy, Jodeci to Backstreet Boys, NSYNC, 112 and One Direction, New Edition’s reach is sturdy and deep. So deep that New Edition has somehow managed to sidestep the dreaded “boy band” label. Artists qualify 25 years after the release of their first single. For New Edition, that’s 1983’s Candy Girl, which features the delightfully earnest debut title single as well as Popcorn Love, Is This The End, and Jealous Girl. Candy Girl, a Billboard No. 1 R&B hit, was recorded when the members were between 13 and 15 years old. In 1984 came the No. 1 R&B/No. 4 Pop hit, Cool It Now, and the No. 1 R&B Mr. Telephone Man,” (written by Ray Parker Jr.). All for Love was in 1985, a 1 million seller that produced the No. 2 R&B single Count Me Out and the black radio favorite A Little Bit of Love (Is All It Takes). A showstopping appearance in 1985’s classic Krush Groove followed, as did an endorsement deal with Coca-Cola, and the holiday album Christmas All Over The World, which featured a cover of the Jackson 5’s Give Love on Christmas Day. It would be the last New Edition album to feature vocals from future solo superstar Brown. Singers Bobby Brown, Ricky Bell, Ralph Tresvant, Michael Bivins and Ronnie DeVoe from New Edition performs at the U.I.C. Pavilion in Chicago, Illinois in January 1985. What truly separates New Edition from its ’80s and ’90s “boy band” peers is their solo ventures. You’d have to go back as far as John, Paul, George and Ringo to find another act that has enjoyed the spoils of individual stardom across the board. Consider this: Following his break from the group, Brown lifted himself into the superstar stratosphere after he moved a remarkable 7 million copies of his 1988 landmark Don’t Be Cruel in the United States alone. The Grammy award-winning Brown is of course his own movie. The relentless dancing machine, whose charismatic pull was so powerful that pop queen Whitney Houston would later marry the two-fisted bad boy, had No. 1 R&B and pop singles in late 1980s and early 1990s — from the Elvis-signifying Don’t be Cruel, to My Prerogative to Every Little Step. Heartthrob and lead New Edition vocalist Tresvant achieved platinum sales with his critically-acclaimed, self-titled 1990 debut. And that same year, the gruff, church-groomed Gill hit double platinum with his self-titled third solo work. And this is not even counting the genre-defining (R&B and rap) and pop takeover success of Bell Biv DeVoe. Their debut single, Poison, also released in 1990, went to No. 1 R&B, No. 3 Pop, and has been featured in movies, television series and video games. The most unlikeliest breakout stars of the New Edition family were seemingly everywhere, becoming BET and MTV favorites. BBD’s Poison album racked up more than 4 million copies. New Edition was following and expanding upon a recipe put in place by groups such as Hall of Fame inductees The Temptations. They were a throwback to the polished, well-choreographed, leave-it-all-out-on-the-floor performers they worshiped. “New Edition deserves to be in the Hall of Fame,” said blues guitarist Tito Jackson from his Las Vegas home. “And hopefully they will make it someday.” Jackson is of course a Rock & Roll Hall of Famer, a founding member of both The Jacksons, and the eternal Jackson 5. 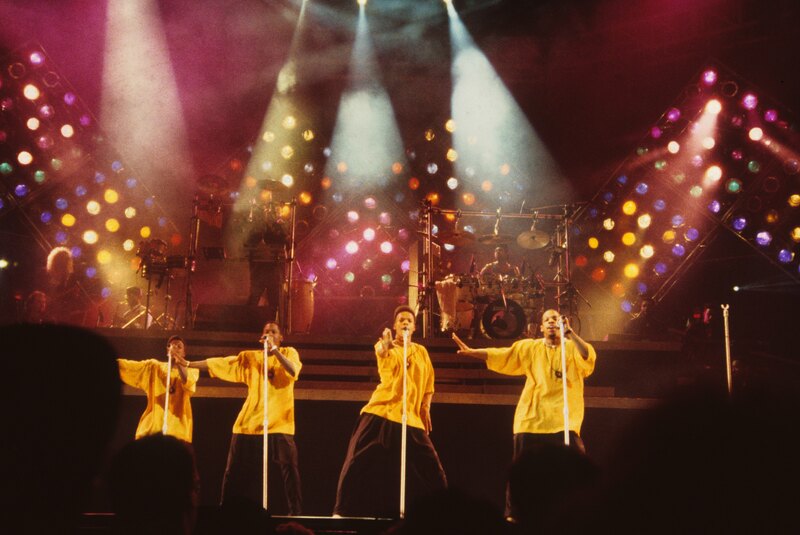 New Edition performs in Minnesota in 1989. New Edition faces an arduous road. Inductees includes the aforementioned Temptations, Bob Dylan, the Supremes, the Beatles, Bob Marley, Aretha Franklin, Joni Mitchell, Stevie Wonder, Jimi Hendrix, Michael Jackson, the Clash, Prince, David Bowie, Donna Summers, Guns ‘N Roses, and Nirvana. A real murderers’ row. Each year, the Rock & Roll Hall of Fame committee — which includes among others Bruce Springsteen sideman and guitarist Steven Van Zandt, founding editor-in-chief of the Source James Bernard, pioneering disc jockey Meg Griffin, bandleader Paul Shaffer, and author/music critic Dave Marsh — nominates a batch of artists on influence, impact and importance to be inducted into the “performer category.” Once ballots are sent to more than 800 music artists, industry power brokers, and historians, the five performers who receive the most votes are included in that year’s induction. From The Doobie Brothers to Devo — the list of so-called snubs is long. Many rock fans are still crying foul that Bon Jovi — the band has sold more than 130 million albums worldwide, and has been eligible since 2009 — is not in the hall. Jon Bon Jovi believes it’s personal. Tina Turner has still not been invited in as a solo act — though she was inducted in 1991 as one-half of Ike & Tina. There were no women inducted into the 2016 class. Metal, EDM, ’80s R&B and pop, and alternative rock continue to be routinely neglected by the Hall of Fame committee. Along with Judas Priest, genre-defining visionaries such as Nina Simone, Slayer, Kate Bush, Willie Nelson, Stevie Nicks, Barry White, Eric B & Rakim, the Cure, the Replacements, and Luther Vandross are still waiting for an invite. There are some cases that bolster New Edition’s cause. British pop rockers exports The Dave Clark Five may have given the Beatles a run for their money in the U.K., even scoring a No. 1 hit in America with 1965’s Over and Over, but the band’s overall impact on this side of the pond remains marginal. Percy Sledge’s soaring 1966 staple When a Man Loves a Woman is one of the most indelible records in the soul canon. But that doesn’t change the reality that Sledge is, essentially, a one-hit wonder — albeit a great one. And what makes the Paul Butterfield Blues Band more deserving of being in the hall than New Edition? 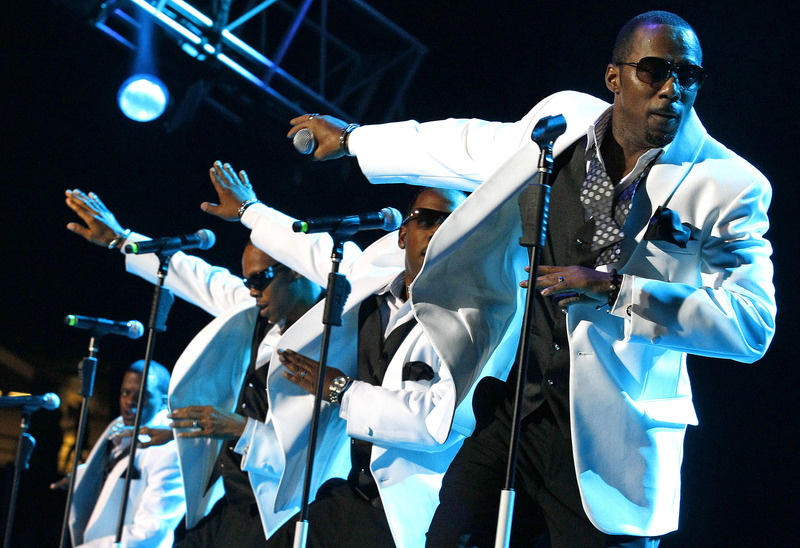 New Edition performs at the Essence Music Festival in New Orleans, Sunday, July 3, 2011. Certainly, New Edition has the stats. According to the Recording Industry Association of America, New Edition has achieved double platinum sales on three releases — their 1984 self-titled debut, the Jimmy Jam and Terry Lewis-produced 1988 set Heart Break, and their 1996 No. 1 pop reunion album Home Again. The group went platinum with 1986’s All For Love and gold with 1986’s Under The Blue Moon. New Edition has also charted five No. 1 R&B singles and four Top-10 Hot 100 pop hits, including such hits as the aforementioned Cool It Now and If It Isn’t Love, Can You Stand The Rain (1988), Hit Me Off (1996), and I’m Still In Love With You (1996). New Edition are bankable road warriors. 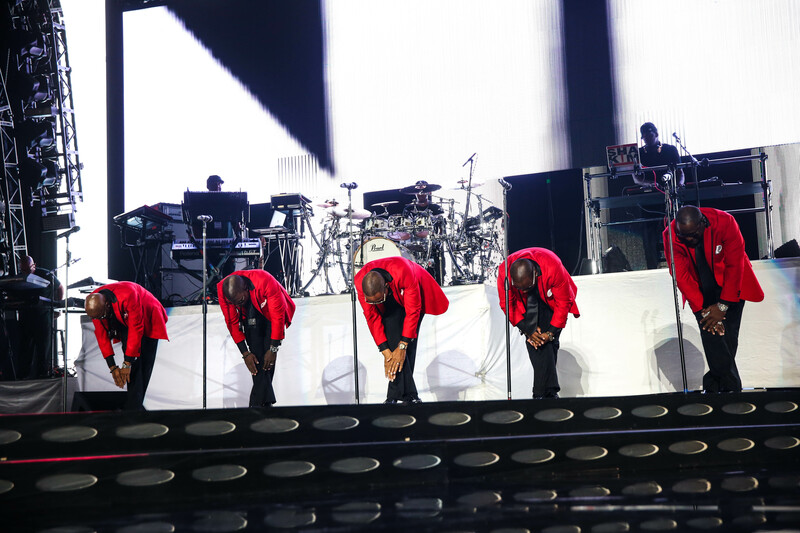 Box office bible Pollstar reports that since Aug. 4, New Edition has hit the concert trail 24 times, averaging a respectable touring gross of $260,453. To put those numbers in perspective, Boyz II Men averaged just $117,811 in ticket sales in the same period. The universe Light is referring to is the post Motown/STAX Records wave of deserving soul, funk and R&B artists who have yet to be inducted. Last year, 16 of the 42 nominating members were dismissed in order to inject what many viewed as a much-needed youth movement inside the Baby Boomer-dominated institution. Such artists as the Roots’ Ahmir “Questlove” Thompson, Rage Against The Machine and Prophets of Rage guitarist Tom Morello, and Foo Fighters frontman Dave Grohl were recruited. In this new environment, LL Cool J — who led the way for Def Jam Records, the most important hip-hop label of the ’80s — would get his much deserved due with an induction. After being nominated in 2013, LL Cool J received the most co-signs by committee members. And yet he was passed over all three times after his ballot was placed before Rock Hall voters. Janet Jackson, whose passionate fan base has called out the Rock Hall over what they perceive to be a continued outright snubbing, finally received a nomination in 2015. She is one of the favorites to earn induction in 2017. Still frustration remains. (L- R) Ricky Bell, Johnny Gill Ronnie Devoe, Michael Bivins, and Ralph Tresvant of New Edition perform during the 2011 Essence Music Festival at the Louisiana Superdome on July 3, 2011 in New Orleans, Louisiana. Henry Fambrough, 77, doesn’t know what to make of the Rock & Roll Hall of Fame. Fambrough is the last surviving original member of the Spinners. He continues to tour, performing such ’70s staples as It’s a Shame, I’ll Be Around, Mighty Love (Part 1), Sadie, and The Rubberband Man. New Edition’s Michael Bivins doesn’t put all the blame on Hall of Fame voters. He said that the younger generation of R&B acts needs to take a page out of the hip-hop community’s book and simply demand more. Flash-forward. Three weeks later and three members of New Edition are taking part in arguably the biggest gig of their careers. Bell Biv DeVoe are performing before President Barack Obama and first lady Michelle Obama’s last White House concert. “BBD KILLING ‘Poison’ & everybody dancing w/ wreckless abandonment,” Questlove said via Instagram of the surreal celebration at 1600 Pennsylvania Ave.
Ralph Tresvant, Michael Bivins, Ronnie DeVoe, Johnny Gill and Ricky Bell of R&B Group “New Edition” perform at the 2016 ESSENCE Festival NOLA Concert at the Mercedes Benz Superdome on July 1, 2016 in New Orleans, Louisiana. Getting completely lit with POTUS and FLOTUS. Who needs the Rock & Roll Hall of Fame?